Having got that out of the way, in this post I will talk about the tools I use, but there are many, and these are not necessarily the best. The mother of all measurement tools and one of the most wide-ranging. Google Analytics. You can measure visits (how many, where they come from, where they go to, user profile, etc. ), the most viewed contents, traffic acquisition channels, conversion and targets, keyword performance, Adwords campaign performance, emailing campaign performance… To summarize, you can integrate most of your campaigns and actions in Analytics and keep everything in the same scorecard. It’s a free tool, but there is also a paid version. Celebrity users: Puma, Shop.com, Moma. The best definition of this tool is the one they give: “Google Analytics tells you what happened, KISSmetrics tells you who did it”, that is to say, who did what in your site. It enables you to track both users and user clusters to see their activity and revenue – the money they bring in. It’s specially conceived for eCommerce and SaaS and enables you to know what happened from the moment when a user came into contact with your website until he or she converted, and what happened later: repeat / non-repeat, total value, daily/weekly/monthly value, etc. It’s a paid tool, and there’s a free trial version. By the same company as Kissmetrics, CrazyEgg allows you to track where users click, how far they scroll down on a page, what they click on by traffic source of origin, etc. It’s like the Google Analytics “page analytics” feature, only much, much better. It’s a paid too, but there’s a restricted free version. An excellent tool to monitor competitors, SEMRush enables you to track the keywords positioned in competitors’ SEO as well as their ads and SEM keywords (Adwords). SEMRush allows you to create a benchmark that can be segmented by country and collected data from Google and Bing. You can also compare domains, monitor keywords, estimate your website’s worth, etc. It’s a paid tool, but there’s a restricted free version. A keyword monitoring tool that can be synchronized with Google Analytics and also collects competitor data. Rank Tracker enables you to monitor SEO keyword position, difference, and visibility, and it covers data from practically all search engines in the world. It’s a paid tool with a free trial version. The best tool for A/B or multi-split tests I know. VWO enables you to change the code in the pages you want to test on the browser screen and establish parameters, such as what traffic you want to lead to each of the test pages, dividing traffic by geolocation and user behavior, the test goals and hypotheses, comparing results, automating display of the winning version at the end of the test, etc. All of this can be integrated with Google Analytics, of course. As well as with Catalyst, Magento, Drupal, Joomla, and WordPress. It’s a paid tool, although there is a restricted free version. 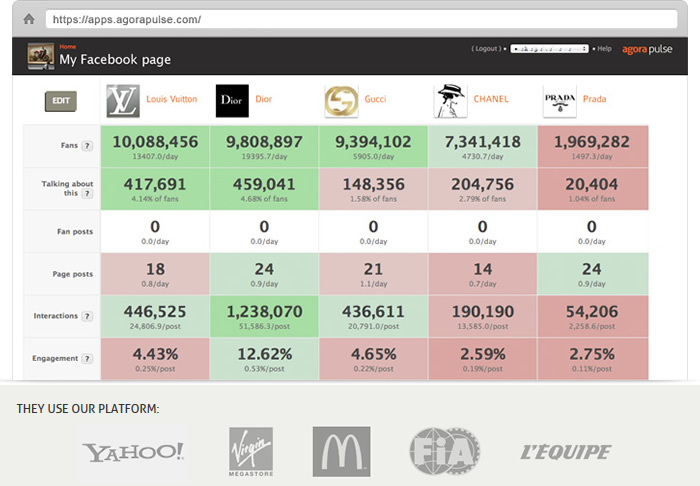 Agorapulse enables you to measure both the activity of your Facebook fanpage and that of the various Facebook apps which you can launch from the SaaS: quizzes, photo competitions, instant prizes, voting competitions, personality tests, etc. Metrics (the app is known as “Facebook Analytics”) include publication visibility, the best time to publish, the dissemination impact of publications, or competition analysis. You can also directly manage the fanpage from the moderation panel: posts, administrators, roles, automatic comment moderation, etc. Pingdom Website Speed Test is an online application that enables you to measure your webpage’s performance in terms of load time and find bottlenecks that are obstructing quick download of your page contents. The load speed test can be performed from a connection in Amsterdam, New York, or Dallas. It’s a free tool and has a paid version. Of all the mass email delivery tools which I have tried, I liked this one the most. It’s not only easy to use, but it can also be easily integrated with Analytics, Facebook, Twitter, Eventbrite, Highrise, SalesForce, Zoho, Etsy, eBay o PayPal. Which enables you to easily measure the return on investment of your emailing – not just how many people opened and clicked, but how much money they generated or how many leads or registrations for an event you obtained. Cool, isn’t it? Ah. It also allows you to run A/B tests on subjects and perform segmentation by group. It’s a paid tool, although there’s a restricted free version. There’s a very cool Spanish version – perhaps you’ve heard about AcumbaMail. It’s like MailChimp only in Spanish: a plus for Spanish speakers.